ESRA Property Services has been undergoing a complete new face lift for the 21st Century. Rebranding, new database, and new office equipment – all ready for an exciting new future. 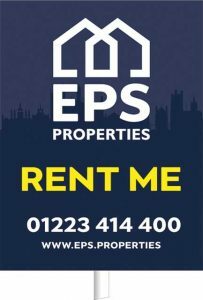 We are now trading as EPS Properties, with our new website and newly designed boards on display, it will be hard to miss us. Please keep an eye out for our new boards. With the Cambridge property market and in particular the lettings industry becoming more and more competitive, we need to make sure we are ready and able to give all our clients the best service possible, as we have done so for many years. We are a local independent company, a family run business. EPS was established in 2004 and has successfully grown each year for the last 13 years. We are determined to remain independent while expanding our business all over Cambridge.